S-Bahnhof Friedrichstrasse Berlin Mitte Capital Germany, originally uploaded by holger doelle. On October 12-14, 2008 I'll be facilitating at VizThink Berlin. For those of you who haven't heard, Vizthink is a global community of visual thinkers who believe the time is right to really engage with visual thinking as a practical way to solve problems and deliver understanding. 1. Flights are really, really cheap right now. I just got a round-trip ticket for less than $800. 2. 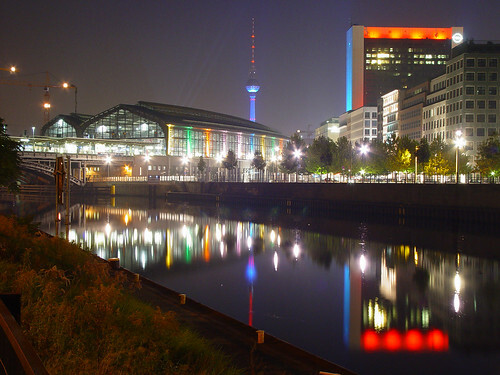 Berlin, by all accounts, is one of the most exciting cities in Europe. The art scene there is world-renowned, with 450 art galleries, with approximately one new gallery opening every week. 3. VizThink will be one of the biggest collections of visual thinkers ever assembled in one place. If you are one of those people who feels a gravitational pull when you're near a whiteboard, you'll find an assembly of like-minded people such as you've never seen before. 4. Yuri Engelhardt will be there. Yuri is at the forefront of visual thinking research, and he's compiled the most thorough exploration and synthesis of visual grammatical forms I've ever seen. Plus you get two-for one: Christian Behrens is one of Yuri's students and a formidable figure in his own right, and he'll be there too. His exploration of visual frameworks, information design patterns, is one of the best in existence. 5. Manuel Lima will be there. Manuel is the genius behind Visual Complexity, a web-based compilation of the most interesting visual information displays on the web. He is also a senior user experience designer at Nokia, looking at the future of how we'll work with information on mobile devices. The people mentioned above are based in Europe and don't come to the US very often, so this may be one of your only chances to see them all together in one place. These are just a few of the speakers, and just a small number of the compelling reasons to go to Berlin this October. I'll definitely be there and hope you will decide to come too. To register, or to get more information about VizThink, visit their website here. Save phone charges by using Skype to call in. Another update: For those of you who missed the call, Jay will be posting a recording and some other links here. I just discovered this very interesting presentation tool which is being developed in Budapest. ZuiPrezi is a zooming presentation editor which allows you to easily create dynamic and visually structured zooming maps of texts, images, videos, PDFs, and drawings. ZuiPrezi has a very intuitive interface and support for online sharing, and it works really well with tablet PCs. This is a tool I can't wait to delve into -- I have been looking for something like this for a long time. Alex Osterwalder does a great job of visually explaining business model innovation. He has several upcoming workshops and speaking engagements, including New York and Toronto, so depending on where you live you might have a chance to attend a workshop in the near future. More detail on upcoming events here. Originally uploaded by Ryan ColemanRyan Coleman put together this excellent video of the recent VizThink get-together in Toronto.